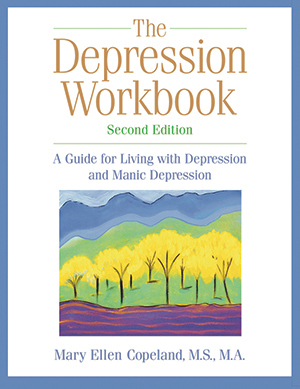 The Depression Workbook (2nd. edition) is for personal use by adults, family members, supporters and health care providers. It can be used as a guide for mental health recovery groups and programs. To make this book easily accessible it should be included in libraries. Health care providers will benefit from having a reference copy and copies to loan to the people they support. A new chapter guides readers through developing their own plan for managing their uncomfortable feelings and behaviors and staying well. This process, known as the Wellness Recovery Action Plan™ (WRAP), was developed by a group of people who experience various mental health difficulties and who now report that this plan helped them feel better and improve the quality of their lives. This edition is updated in all areas, including new medical and holistic perspectives and extensive lists of helpful resources and Web sites that will assist you in your journey to wellness. By letting you share more than a hundred case stories and empowering you with the most current therapeutic strategies, The Depression Workbook, Second Edition will give you insight, energy, and hope. It is in an easy-to-use format and contains forms that guide people through the recovery process. This book is one of the texts for the Mental Health Recovery and WRAP Correspondence Course (for more information on this course go to www.copelandcenter.com).